A special meeting of the Northern Ireland Policing Board will take place on Tuesday to discuss the PSNI's handling of legacy files. 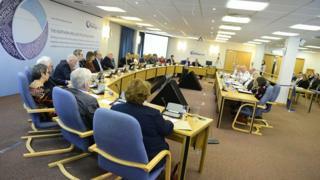 The board will also discuss how best to appoint the next PSNI chief constable. It follows complaints that the recruitment process has already been compromised. The meeting of the 19-member board was originally called to discuss the legacy issue, but will now deal with the recruitment matter too. It emerged earlier in February that all of the police files relating to the Sean Graham Bookmakers' killings by loyalists in Belfast in 1992 were not handed over to Police Ombudsman Michael Maguire when he first asked for them. A report on what went wrong was demanded by the board. A detailed response was sent by Chief Constable George Hamilton last week. The BBC has seen the report, which blames "human error" and denies allegations that the files were deliberately withheld. At Tuesday's meeting - which will not be held in public although Mr Hamilton is expected to speak to the media afterwards - the chief constable will face questions from the board. Before discussing the legacy files, the board will meet in private to discuss the recruitment of a replacement for Mr Hamilton when he steps down from the top job in June. Last week, Sinn Féin president Mary Lou McDonald said she could not identify anyone within the current senior leadership at the PSNI who was capable of taking over. Her comments were criticised by unionists and the Alliance Party, who claimed the recruitment process may have been compromised by the remarks, given that a Sinn Féin representative is usually on the recruitment panel. The Policing Board announced last week that it was seeking legal advice. It is understood that the advice has now been received and will be discussed by board members at the meeting. Among the senior PSNI officers who may be considering going for the job are Deputy Chief Constable Stephen Martin and Assistant Chief Constable Mark Hamilton. A number of senior officers in England, Scotland and the Republic of Ireland are also believed to be considering applying for the post.